1. Preheat the oven to 160C, and line a 8inch round cake tin with baking paper. 2. To make the cake, beat sugar and eggs with electric beaters until light and fluffy, this will take around 5mins. Set aside. 3. Sift the flour and baking powder twice and then use a metal spoon to fold it into the egg mixture. Finally mix in melted butter. Pour into prepared tin and bake in the oven for 25-30mins. 4. To make meringue, beat egg whites with an electric mixture on high. Once whites start to come to a soft peak, start to add the sugar 1 tbsp. at a time. Then continue to beat until the meringue is thick and glossy and all the sugar has been dissolved. 5. To assemble: use the lid of the Halo Top tub to cut out a disk from the sponge. Remove the ice-cream from the freezer and run a knife around the edge. Then turn it upside down on the sponge and carefully squeeze the tub to remove the lining so it comes out in one piece. 6. Using a spatula cover the ice-cream and sponge with the meringue and then toast it with a blow torch to slightly cook the meringue. 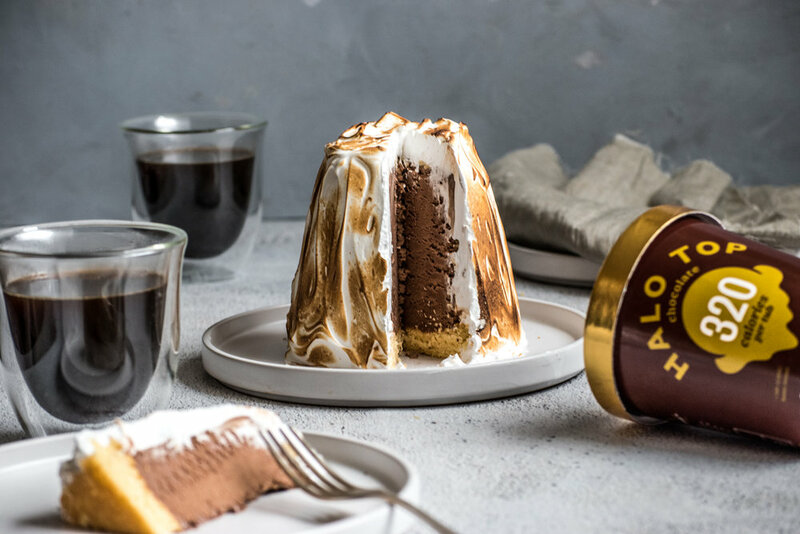 If you don’t have a blow torch, heat the oven to 160C and place bombe Alaska in the oven for 2-3 mins keep careful watch so the ice-cream doesn’t melt. 7. Place in the freezer until ready to serve!